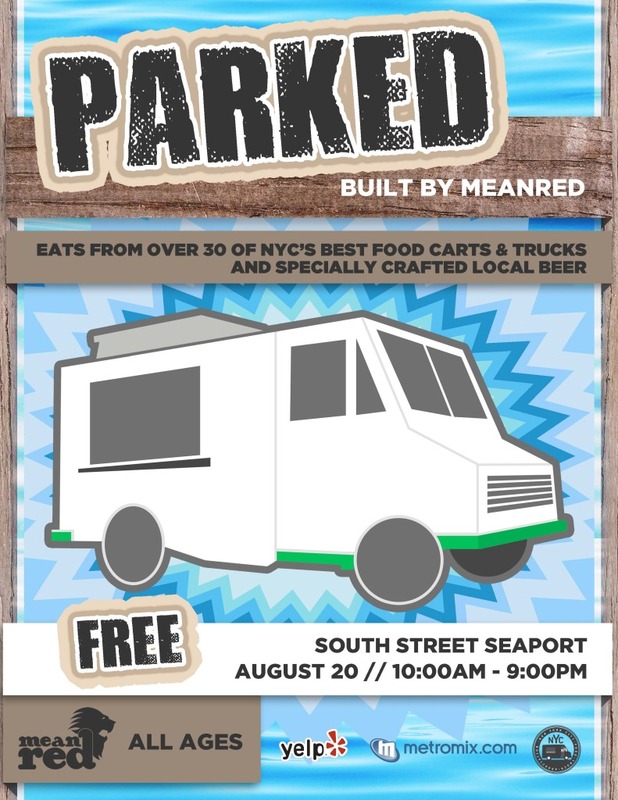 This Saturday, August 20th, over 30 food trucks will be gathered at South Street Seaport for PARKED! This festival, organized by Mean Red Productions will also have a beer garden, a main stage with incredible hands and DJs, face painting, cooking demos and an on-site playground for kids. Participating trucks include Big D’s Grub, CoolHaus Ice Cream, The Cinnamon Snail, Cupcake Crew, Feed Your Hole, Frites ‘n’ Meats, Gorilla Cheese Truck, Go Burger, JoyRide, Kelvin Natural Slush Co., Kimchi Taco, La Belle Torte, La Cense Burger, Mexicue Food Truck, Red Hook Lobster Pound, Taim Falafel, The Treats Truck, Valduccis Pizza Truck, Van Leeuwen Ice Cream, Wafels & Dinges, Green Pirate Juice, Schnitzel and Things, Desi Food Truck, Two Pitas, Wooly’s Ice, and Anne Apparu Soup Caravan. For a preview, check out this article. PARKED! VIP Passes are available for purchase. They’re valid from 5 to 7pm and comes with 10 small bites from 10 trucks and a free drink. It also gets you access to the VIP express line at all trucks, so no long lines!